A crowdfunded campaign to replace ads with pictures of cats was launched this week at Clapham Common Tube station in London. 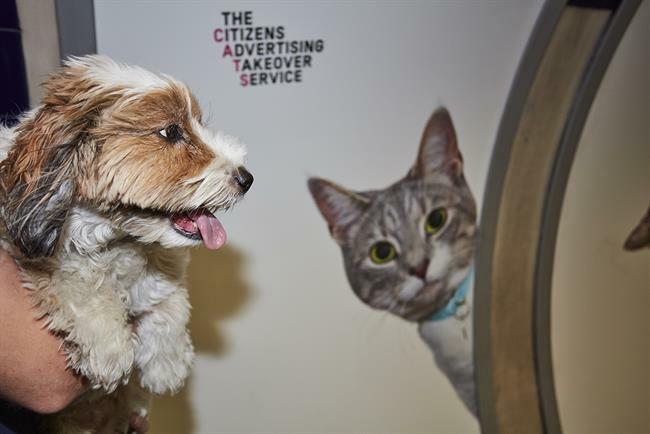 The Citizens Advertising Takeover Service (CATS) replaced 68 ads in the station after organizers raised £23,000 on Kickstarter. The featured felines are stray cats from two rescue charities, Battersea Dogs & Cats Home and Cats Protection. The initiative is the first project from Glimpse, a new collective which aims to use creativity for social causes. "The idea is that it creates a peaceful, hopefully quite fun and funny space that you walk through on your way to work," said James Turner, Glimpse's founder. "[We hope] it makes you feel a little bit different to the cacophony of ads you normally see on your commute." Glimpse is in the process of planning its next advertising takeover and is inviting people to submit ideas at CatsNotAds.org.